It’s rare to find a journalistic CV as storied as that of Sir Harold Evans, which includes the breaking of the Thalidomide scandal, a bitter dispute with media magnate Rupert Murdoch and a working relationship with Donald Trump. The US President, he caveats, ‘is not my favourite person’. In a career spanning 70 years, the former Times chief has been no stranger to acclaim. Held up as ‘the editor’s editor’ by luminaries, his wide ranging address at Cardiff’s School of Journalism, Media and Culture demonstrated exactly why. Titled ‘Do I make myself clear?’, Sir Harold’s talk initially took the form of a masterclass in reporting linguistics – or, as Sir Harold put it, ‘eloquence under siege’. Illustrating his points with classic examples from history, he dropped a trail of advice for students who had willingly stayed long after hours. Having dispensed helpful one liners – many more of which can be found in his new book of the same name – Sir Harold delved deeper into his legendary career in journalism. And his thoughts soon turned to the urgent matter of the industry’s beleaguered economics. The answer, he said, lay in a combination of taxation of social media giants and philanthropic sponsorship – whilst the paywall mulled by so much of the industry was derided as a threat to free speech. 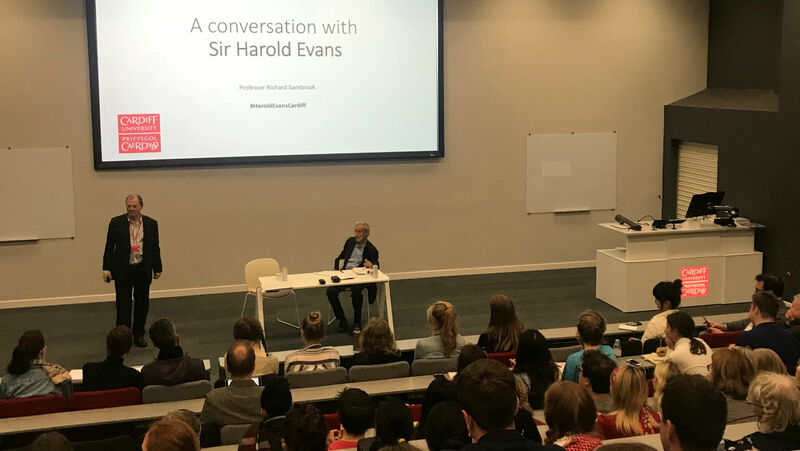 Ending his address with a standing ovation from the capacity crowd, Sir Harold spent the evening talking with those who had come to listen and to learn. On Twitter, he proclaimed himself ‘heartened by [their] questioning spirit’ – as they surely were by his instructional rallying cry.